Are you searching for an unforgettable sales keynote speaker for your next corporate meeting? Would you like this speaker to be high energy and able to deliver relevant sales strategies and motivation in a unique manner, who also has a ton of experience in real-world sales? We understand that hiring a sales keynote speaker can be time consuming and stressful. Let Waldo Waldman be your wingman on this mission. 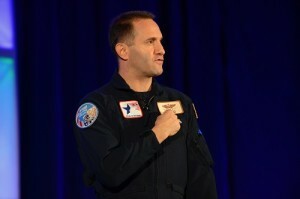 Waldo leverages his experience as a fighter pilot and sales manager to deliver a customized, entertaining, and high content program for your meeting. His passion for building high performance teams and creating cultures of trust and mutual support serve as the foundation for his keynotes. 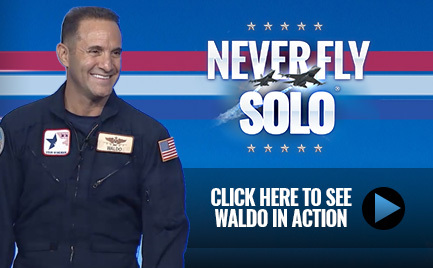 Waldo is the author of the national bestseller Never Fly Solo which was voted the Top Sales Leadership Book of 2012 by Selling Power Magazine. A successful businessman and entrepreneur, he’s delivered sales keynotes for over 13 years and has the real-world experience and reputation critical to attract attendees to your conference or event. He has been featured in Fox News, CNN, MSNBC, Business Week, and The Harvard Business Review. Waldo’s motivating and inspiring sales keynotes, seminars, and workshops have transformed hundreds of companies and have boosted the sales, morale and productivity of companies such as John Hancock, Johnson & Johnson, Honda, Marriott Hotels, Novartis, Subway, and Medtronic. When Waldo plans for your corporate sales event, he diligently prepares for every mission and customizes his programs to meet your specific needs. He consistently delivers a unique and high energy keynote. Waldo is a master at customizing his multimedia, high-energy, and interactive sales keynotes to fit any audience. Call Waldo today and let him be your wingman and help you flight plan a top gun event for your meeting. Call 1-866-925-3616 for a presentation folder and a full demo video.